Your device with your apps — all in one place. The Connect IQ Store is the place where you download free apps, widgets and more to personalize your device. It’s also the one-stop platform you’ll use to manage all your downloads. Personalizing and adding more functionality to your compatible Garmin device has never been easier. Our Connect IQ Store is your one-stop shop for apps, widgets, data fields and watch faces. Finding the ones you want is a snap. You can search by name, browse by category or narrow down by app type. To find the best selections, you can also check out ratings and read reviews from your fellow Garmin users. Then wirelessly download them to your device. That’s it! It’s not just a place to browse for new apps, widgets and data fields. Our Connect IQ Store is also an easy-to-use platform for managing your Connect IQ downloads. See what apps are currently installed and how much storage remains on your device. Enable or disable update notifications and other settings, too. It’s all controlled right from the app on your smartphone. With thousands of apps and widgets to choose from — and more being added all the time — you’ll keep finding new ways to get more out of your favorite Garmin devices. Turn on your lights at home with the SmartThings app, and even use the AccuWeather MinuteCast app to find out when the rain will start. Add and configure data fields that let you see additional metrics during activities. Just download a data field, and add it to your desired activity profiles to start seeing new stats. For example, the Running Power app from Garmin Labs lets you tap into metrics collected by your compatible Garmin devices to calculate and show your running power in real time. 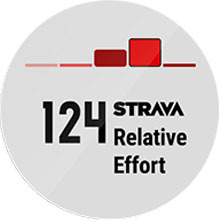 If you’re a Strava Premium member, you can look at your Relative Effort, a second-by-second score for how hard you’re working. Or see a live graph of time spent in defined heart rate zones, a colorful gauge that shows changes in elevation and much more. Choose from hundreds of watch faces that let you wear your personality (and your stats) on your wrist. Many of them are customizable, so you can choose your favorite colors and styles. Even choose preferred fields that will show your current step count or your device’s battery life. Want to make your watch truly your own? Choose any photo from your smartphone, adjust the style, and set it as your watch face.